Back in the early 1960s, spending on health care in the United States was under 6% of GDP. In the data released for 2012, U.S. health care costs are 17.2% of GDP. As the share of the economy being spent on health care has tripled, arithmetic teaches that the share being spent on everything else must diminish. When I was first studying health economics back in the late 1970s, it was common to hear that rising health care costs were already out of control. But we have now reached the point where many people have been facing the trade-off of more costly health insurance from their employer at the cost of lower take-home pay. The long run budget problems of governments at all levels are largely driven by the prospect of continually rising health care costs. Accounts Team in an article called "National Health Spending In 2012: Rate Of Health Spending Growth Remained Low For The Fourth Consecutive Year." It's in the first issue of Health Affairs for 2014 (pp. 67-77). (The article is not freely available on-line, but many will have access through library subscriptions.) The authors are government actuaries and staff working for the Centers for Medicare and Medicaid Services. 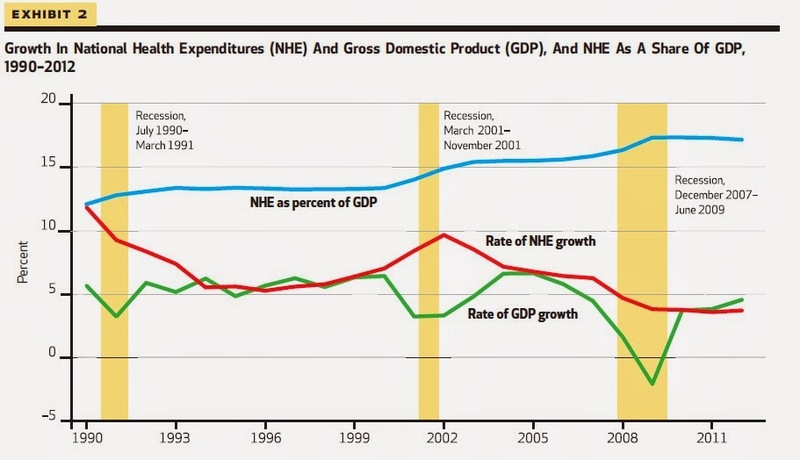 Here's a graph in which the blue line shows national health expenditures (NHE) as a share of GDP since 1990, while the red line shows the annual percentage growth rate of health care spending. The red line makes two obvious points. First, the slowdown in rising health care costs started back around 2002 or 2003. Indeed, health care economists have been writing about it for a couple of years now, and OECD evidence point out that a similar slowdown seems to be occurring across high-income countries. Thus, eager claims by Obama administration officials about how the Affordable Care Act--although still far from fully implemented--is bringing down the rise in health care costs are a prime example of finding a parade, running to the front, and then claiming to lead the parade. As the writers of the Health Affairs article note: "The Affordable Care Act (ACA), which was enacted in March 2010, had a minimal impact on overall national health spending growth through 2012." Second, a slowdown in health care costs is also apparent back in the 1990s. At that time, the common explanation was that the spread of "managed care" plans was holding down costs. For connoisseurs of the embarrassing moments of economists. the Journal of Economic Perspectives (where I've worked as Managing Editor since the first issue 1987) published a paper in the Spring 2003 issue by Sherry Glied called "Health Care Costs: On the Rise Again." 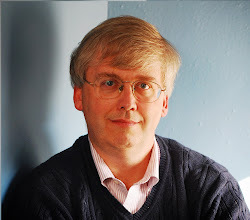 Gleid reflected the consensus of the time by pointing out how unexpected the slower rise in health care costs had been in the 1990s, and predicted that such low rates of rising health care costs would not recur. She also pointed out that "forecasts of health care costs growth are notoriously unreliable." So are we seeing a slowdown in the rise of health care costs that is likely to last? Or a shorter-term swing in health care costs like the 1990s? My crystal ball is cloudy, cracked, and stuck in the back of a closet. The government actuaries note that part of the reason for slower growth in health care expenditures in 2012 were factors like the "availability of lower-cost generic drugs [as some widely used drugs went off-patent] and changes in Medicare payments for nursing home and physician services." Medicaid enrollments slowed down in 2012, as the economic recovery took hold, but as the Affordable Care Act takes effect they seem certain to rise. In general, 2012 was a year when prices for health care rose relatively little, while quantities of health care consumed rose more quickly--a pattern than may not be sustainable, either. sector and the overall economy." While it's fine to hope that the rise in health costs is slowing, it seems unwise to plan as if it is a sure thing. A Fiscal Crisis: Top Concern for 2014? What's Up with Muhammad Yunus and Grameen Bank?